When the local livery stable must close down to make way for a new DIY superstore, Moya and Sue must try and find a new home for their ponies. They don’t have much luck however as they live in an urban area and all the livery places are too far away or too expensive. Then one day Moya meets Tim who tells her he is squatting at The Grange, a large house with extensive grounds which was abandoned some time ago by its past owners, the Carlisles, when they were wanted by the police for fraud. He suggests that the girls keep their two ponies there as there are plenty of fields and stabling too. Altho the girls know they will have to keep the place secret it seems a good solution. Soon the ponies are installed in The Grange and the girls have made friends with the assorted group of squatters who live there. They all seem fond of animals and welcome the ponies and the girls. One day Jo, one of the squatters, announces that she has found an ill-treated Appaloosa horse and they all decide to rescue him. After Spotty, a series of neglected and abandoned ponies arrive at The Grange, which is turning into an unoffical horse sanctuary! Meanwhile Moya and Tim are becoming close. But after an argument Tim disappears and even worse, the Carlisles, previous occupiers of The Grange return, looking for a stash of money they had hidden before they fled the country to escape imprisonment for fraud. Is this the end for the squatters, the girls and all their ponies? This is undoubtedly a ‘modern’ pony book rather than a traditional one, but it somehow manages to retain the feel of a traditional pony story. This is no mean feat considering just how uncompromising the book is in portraying teenagers. The girls skive off school, drink lager and occaisionally smoke, despite the fact they are only 16. This is almost shocking after reading a lot of old traditional pony books: one cannot for instance imagine Noel Kettering or Jill swigging a lager and having a f*g! The book does not set out to present a cleaned-up anodyne version of a teenager, but the real thing, warts and all. This will probably make the book more appealing to teenagers but may put off the older reader, used more to the old-fashioned type of pony story. However, this realism does not interfere with the main story which is firmly traditional in plot. Although the girls are no angels and are interested in boys and make up and swigging the odd can of lager, this is wisely kept as a backdrop. The horses are the girl’s main interest and it is their quest to find a home for them, and later the rescue of the other horses, which shapes their lives. This is where the book differs from many other modern teen pony stories in which the horses seem merely window dressing for a story that is nothing but a lot of tantrums and teen romances. The book deals with important real issues too. Firstly, that of urban development making it harder and harder for people to keep horses. The place the girls live is no rural idyll; it has only one central livery stable and few places to ride. This is an issue often ignored by pony books, but is a very real modern problem and one I too experienced myself when my old home town become increasingly built up and fields and stables were swept away to make room for housing and business estates. Another issue it explores is that of homelessness and alternative lifestyles, once again not exactly commonplace in the pony book where the usual representative of the alternative lifestyle – the gypsy – is normally the villain of the piece, or at least treated with contempt. In this story, the squatters are seen to be very nice and caring people, despite some having an odd appearance or shady past! However once again these examples of realism are embedded in a more old-fashioned plot: that of the girl’s rescuing neglected horses – a real stalwart of the traditional pony book. 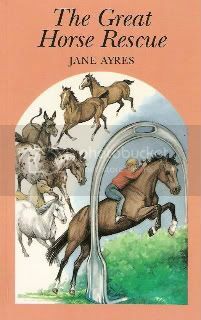 The end too, with Moya riding to the rescue on her horse when a pair of crooks appear, is also pure old-fashioned pony book melodrama! The book is well-written, readable and the characters are engaging and believable. It is not a classic by any means and the plot is nothing out of the ordinary, but it is a very good example of how a modern pony book can retain a flavour of the traditional without ignoring the fact that children and attitudes have changed a lot since the hey-dey of the pony story. For those older readers who have read the likes of the Saddle Club and Chestnut Hill and depaired, I would recommend giving this one a go!